URBANA – Urban agriculture is promoted as a strategy for dealing with food insecurity, stimulating economic development, and combating diet-related health problems in cities. However, up to now, no one has known how much gardening is taking place in urban areas. Researchers at the University of Illinois have developed a methodology that they used to quantify the urban agriculture in Chicago. On closer inspection, however, many of these “gardens” turned out to be planter boxes or landscaping and were not producing food. On the other hand, Taylor suspected that there were unnoticed gardens in backyards or vacant lots. “There’s been such a focus on community gardens and urban farms, but not a lot of interest in looking at backyard gardens as an area of research,” Lovell agreed. An accurate map of these sites would be helpful for advocacy groups and community planners. Using these indicators and Google Earth images, he examined the documented sites. Of the 1,236 “community gardens,” only 160, or 13 percent, were actually producing food. To map the gardens onto community areas, the shapefiles were joined with 2010 Census tract shapefiles and shapefiles of 77 community areas and neighborhoods from Chicago’s GIS portal. The tract information was subsequently joined with the Census Bureau’s 2005-2009 American Community Survey (ACS) 5-year estimates of demographic and housing characteristics. The maps showed that garden concentration varied by neighborhood. “Chinatown, Bridgeport was kind of a hot spot,” Taylor said. Both of these neighborhoods have large Chinese-origin populations. Even outside those areas, many of the larger gardens were associated with households headed by people of Chinese origin. Neighborhoods in the northwest with large numbers of Polish and Eastern and Southern European immigrants also had a high density of backyard gardens. They were not all growing the same kind of food. “There are distinctions between these cultural groups because the crops they select are sometimes from their home areas in addition to the suite of crops we can all grow in our backyards,” Lovell explained. He noted that many older African-Americans in Chicago who came north during the Great Migration from the south from the early 1900s to the 1970s remember farming and growing up with gardens. “They are almost reproducing in miniature in their backyards the southern landscape and gardening practices that they associated with their youth,” he said. 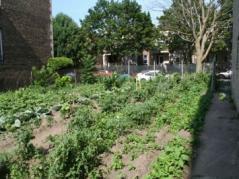 The results of this study suggest that both backyard gardens and vacant lot gardens contribute substantially to Chicago’s total food production. “Home gardens actually contribute to food security,” Taylor said. “They’re underappreciated and unsupported.” He noted that people grow not only for themselves but for their neighbors as well, which is particularly important in food deserts where fresh produce is in short supply. “There is also potential for empowering people because they are using their own space to deal with their own food security concerns,” Lovell added. The study, “Mapping public and private spaces of urban agriculture in Chicago through the analysis of high-resolution aerial images in Google Earth” by John R. Taylor and Sarah Taylor Lovell, published in Landscape and Urban Planning, is available online at http://www.sciencedirect.com/science/article/pii/S016920461200237X.